This is the doormat outside our RV. You can tell that sick minds are at work here. Jollymon writes "What is your charitable foundation?" Send those cards and letters to the Old Pirates Retirement Home folks, care of ... And mark the comment line with "rum fund". No, seriously ... please don't. I am reminded that the recently deceased Louis Wolfson, a major financial patron here in Jacksonville, went to the klink after he sold unregistered securities. Securities which he had dutifully reported to the Feds in the first place. And that his "charitable contributions" in the 60's lead to the resignation of Supreme Court Justice Abe Fortas. As we all know, no good deed goes unpunished. I have this vision of seeing my name in the local newspaper. And not in a good way. She Who Must Be Obeyed and I actually have looked into a couple of charitable things that we could do to help out, but so far nothing has quite meshed. Back about a decade ago Yours Truly was pretty active with the Red Cross as a Disaster Volunteer. Now don't get me wrong - I think that overall the Red Cross does a pretty fair job - but I just didn't feel like the Red Cross was dramatic enough for my tastes, let's put it that-a-way. The Lovely Ms. Deborah has been active in local church food kitchens for the last few years. They feed the down and out, and the group that she has been working with has a small group home for folks who are recovering from various addictions. Part of our reasoning behind getting the Bluebird Wanderlodge is that the big old steel bus is just that - a big old solid bus with a relatively huge generator and equally huge holding tanks for drinking water and non-drinking stuff, if'n you get my drift. We are trying to get geared up to go somewhere if needed. I think that it's fair to say that the events in New Orleans of a few years ago were a wake up call for many of us. That natural disaster was more than a mere inconvenience or a mere couple of days without power. That was a life-threatening debacle of massive proportions that has become a national shame. And just as FEMA was woefully unprepared, those of us who would have liked to have volunteered were not really prepared either. So that was part of the thought behind reconditioning the old Wanderlodge, rather than buying that fancy Winnebago that we looked at once upon a time. The one with the slideouts, and the fancy interior, and the beautiful exterior, and the ... oh never mind. That one. You get the picture. Moving forward, one of my personal inspirations when it comes to the local charitable scene is Bill Wharton, a/k/a The Sauceboss. If you are a Jimmy Buffett fan then you have likely heard of Bill. He's Jimmy's inspiration for the Buffett's tune "I Will Play For Gumbo." Bill's an excellent blues musician and part of his schtick is that he prepares a pot of gumbo for the crowd at his shows as he peddles hot sauce. Good food, hot sauce, and blues - that's a tough act to follow. Bill also founded a Tallahassee-based charity called Planet Gumbo - http://planetgumbo.org/ - that feeds the less fortunate. But they don't just feed 'em the same old gruel - no Sirree! Planet Gumbo prepares good food and Bill performs for free at homeless shelters around the nation, bringing a little hope and joy. There is just something about Bill's approach that appeals to me. Back in my Red Cross days we would regularly pick up a load of 150-300 Hardee's cheeseburgers and drag them out to sites where we had to feed folks. And nothing quite says "we're in a world of hurt" like a cold Hardee's burger. Anywho, Deb and I have kicked around organizing a group to prepare food during disasters. What we have had in mind was possibly getting together with some of the local biker groups and preparing food for their events. That way we could develop a group of folks who were skilled at preparing food for a group, out in the open, with portable equipment, and the monies that would be raised would go into a fund to pay for food and travel expenses the next time that a major disaster (and disasters Down Here always mean hurricanes) struck. That's the theory at any rate. For the biker functions we had looked at getting some sort of portable bar-b-que equipment. Everyone loves a good bar-b-que. But that plan breaks down somewhat when you start to look at the logisitcs of moving all of that stuff into a disaster site. The volume of folks that you can serve is severely limited, largely because the best bar-b-ques take hours and hours to cook properly. And the really large bar-b-que trailers that are adequate to the task aren't exactly cheap, let me tell ya Brother. Then you get into issues with not having refrigeration at a disaster location, and having your meats trucked in. Pretty soon you wind up looking at a pretty fair sized logistical operation when you factor in moving our bus for living space for volunteers, using a second truck to move a bar-b-que trailer, and then a third truck might be needed to move and/or store refrigerated meats. Simplicity is one of the charms of Bill Wharton's gumbo. Gumbo is healthy, warm, and tasty. It's also relatively simple to make in quantity. And the ingredients are cheap. Not to say that The Ingredients, which is the name of Bill's band, are cheap or anything. That's beside the point. We used our current and rather modest cookin' equipment last year when Bill Wharton was in town and put on a gumbo cookin' contest. 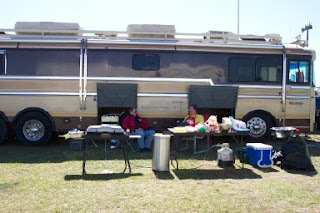 We have also used the same equipment for the last few years to grill burgers and so forth at the International Speedway in Daytona Beach during some of the motorcycle races. Those gigs raised money for the motorcycle club and those monies by and large were contributed to charities. No matter how you slice it, cooking decent food for 60 to 100 folks can be a lot of work. And I have to commend Ms. Deborah for organizing those events and cookin' the chow. For most of last year and into the foreseeable next several months the disaster relief cookin' project is going to be on the back burner as we concentrate on careers, writing, and some maintenance projects. But if there is anyone out there who wants to talk, seriously, about doing a disaster relief-oriented project to prepare tasty food then I'd be interersted in talkin'. And you know where you can find me.